Sunnyvale, CA – September 25, 2017 – Landsea Homes, one of the San Francisco Bay Area’s fastest growing builder/developers, recently held its initial sales offering at The Vale, their newest planned community in Sunnyvale, CA. In mid-August, Landsea Homes released 17 townhomes in phase one of the community and all were sold out within two hours. 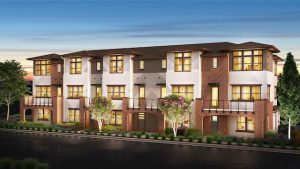 Eight units were sold in the Echo neighborhood, while nine units were sold in the Nexus neighborhood. Many the sales were to first time local and international home buyers and the average sales price was $1,400,000. “We are extremely excited about the great reception to our initial offering of townhomes in The Vale. It’s a real testimony to our uniquely designed, quality-built homes, combined with the excellent lifestyle amenities already in place within the community. Our newest buyers definitely see the benefits of luxury townhome living within a tranquil, park-like setting that’s close to Silicon Valley, shopping, schools and more,” said Greg Balen, President of Landsea California. Echo at The Vale offers three distinctive townhomes all offering 3-story floorplans, large open living rooms, dining rooms and eat-in kitchens, a first-floor den/bedroom and bath, and 2-car garages. The homes boast 3 and 4 bedrooms, 3.5 to 4 baths and range from 1,851 to 1,875 square feet. Echo townhomes are priced from the mid $1.3 millions. Nexus at The Vale offers four unique 3-story floorplans, large open living rooms, dining rooms and eat-in kitchens, a first-floor den/bedroom and bath, and 2-car garages. The homes boast 3 and 4 bedrooms, 3.5 to 4 baths and range from 1,960 to 2,014 square feet. Nexus townhomes are priced from the high $1.3 millions. The Vale community has been carefully designed to provide residents with a real sense of community. The amenities in the community have been designed to offer convenience, encourage spontaneity, and provide a complete inside/outside experience. The community clubhouse named The Nucleus is the focal point of the community. It’s designed as the perfect gathering place for residents to relax with a good book, challenge a neighbor to a game of outdoor ping-pong or tend to the community garden. An expansive meeting room is perfect for hosting parties to celebrate birthdays, anniversaries, meetings or dinner parties. Residents can also enjoy spending time outdoors with their families in the Echo and Nexus neighborhood parks, as well as The Vale Community Park that’s conveniently located for all residents to enjoy. For more information about the Vale, please visit www.livethevale.com or call 408-214-0558.